May 25, 2017: Can I purchase an HDMI splitter so I can use 2 HDMI outputs on my graphics card that only has 1 HDMI slot? Nov 28, 2017: What happens if I hook one of these to the other? Will I have 5 usable ports? Mar 14, 2018: Looking for an HDMI Splitter that works with the Switch. 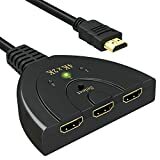 Mar 19, 2018: Anybody have any experience using an hdmi switch? Mar 30, 2018: I'm looking for the right HDMI hub to fill some needs. Nov 24, 2018: Hooking up SNES to Digital TV? Will an AV to HDMI converter make it work? Feb 09, 2019: 1 HDMI port, but 3 devices, what do I need to do to plug them in? Mar 05, 2019: I have an HDMI switch for my PS4 and PC. I can only get the PC to work on the switch if I turn on the PS4, pull out the HDMI cable, and quickly put the PC HDMI in that slot. Anyway to fix this?